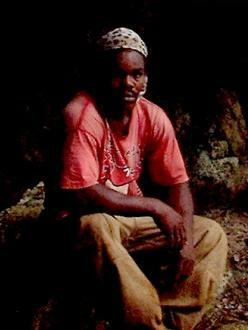 Tumpa is one of the non-caving members of the Crew but his presence on caving expeditions is important nonetheless. Tumpa helps to keep things safe on the outside while we are on the inside. He has donated a lot of his time through the years, helping out, and has asked for nothing more than a good meal, a few Red Stripe, and an opportunity to join us on our adventures. Tumpa's main contributions to the Organization are security, helping to carry gear, and reminding us that it is dinner time. He can be found in Coxheath, Trelawny, or contacted via this site, and is recommended to any tourists who might require a sturdy, trustworthy porter for trips across the Troy - Windsor Trail. (Although he donates his time to the Crew, tourists cannot expect a similar arrangement).